Australiteuthis aldrichi was described from numerous specimens collected from the inshore waters of Northern Australia. 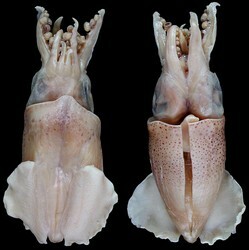 This is a dwarf species, the largest squid described was a mature female of 27.6 mm ML. The holotype is a mature male of 21.3 mm ML. The small squid has never been observed alive. with peculiar funnel locking-apparatus containing a boomerang-shaped groove. with fins separated from one-another and with posterior lobes. with dumbell-shaped photophore on ink sac. Funnel locking apparatus with subcircular shape and "bisected by a boomerang-shaped groove running anteroposteriorly. Anterior wing of the boomerang-shaped groove deep, with wide anterior end, groove deepens and becomes slightly narrower posteriorly to form deep, broad pit. Pit becomes a narrow and shallow groove posteriorly and turns medially forming posterior limb of the boomerang, posterior end of groove slightly widened." (Lu, 2005). Mantle component does not reach anterior mantle margin. Figure. 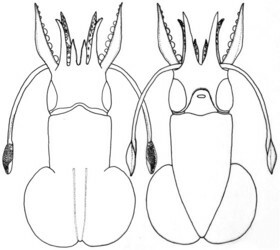 Frontal views of the funnel/mantle locking-apparatus of A. aldrichi, 17.3 mm ML, mature male, paratype. Top - Mantle cut open showing the funnel and mantle components of the locking-apparatus on the left side. Photograph from Lu (2005). 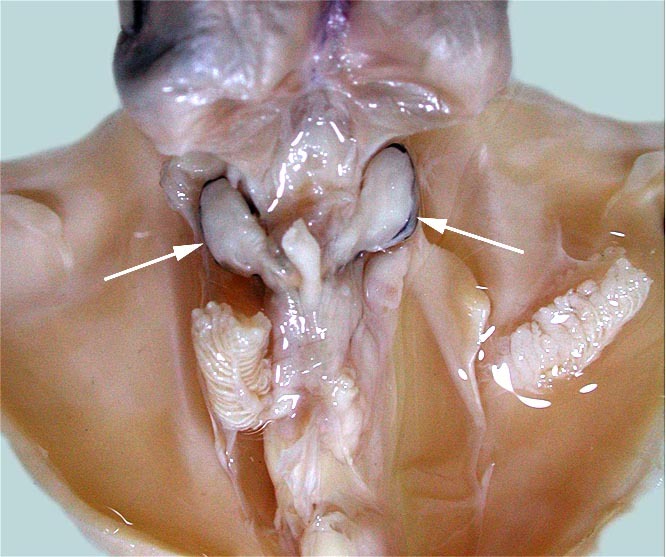 The photograph also shows that there is no lateral adductor muscle connecting the funnel to the head and that there is no ventral secondary eyelid on the eye, a character state similar to that of loliginids but not sepiids and sepiolids. Bottom left - Funnel component. Bottom right - Mantle component. Bottom drawings were of the right locking apparatus but the illustration here has been flipped to coincide with the photograph. Drawings from Lu (2005). Fins large, round, separate (length 47-63% of ML, width 80-104% of ML); separation at posterior end inconspicuous. Fins with free anterior and posterior lobes. Figure. Dorsal and ventral views of the fins, holotype. Enlargement from the title photograph. Large dumbell-shaped photophore present. The photophore appears to contain a large population of bacteria (Lu, 2005). More details of the description can be found here. Type locality: Joseph Bonaparte Gulf, Western Australia at 14°07.30S, 128°02.00'E. In addition to Joseph Bonaparte Gulf, squids have been collected from inshore waters near Darwin and Paupa New Giunea, which suggests a rather broad distribution in shallow waters of this general region. Lu, C. C. 2005. A new family of myopsid squid from Australasian waters (Cephalopoda: Teuthida). P. 71-82. In: Chotiyaputta, C., E. M. C. Hatfield and C. C. Lu (editors). Cephalopod biology, recruitment and culture. International Cephalopod Symposium and Workshop, 17-21 Feb. 2003. Research Bulletin, Phyuket Marine Biological Center, No. 66, 365 pp.